Ron Skead of Allcrete Design shared this story about a recent project: A couple purchased a new home and completed some upgrades from the builder. 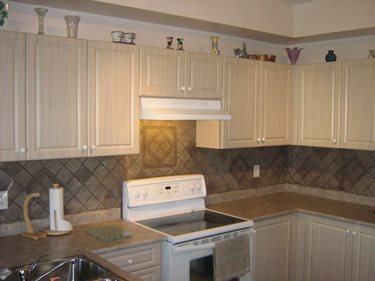 One of the upgrades included a ceramic backsplash. 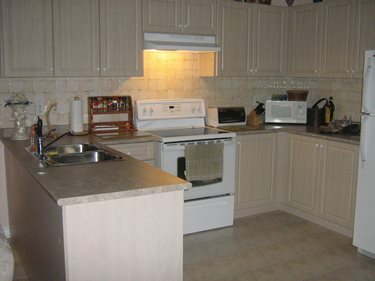 Once the house was ready for viewing and they were doing their final inspection of the home, they noticed the backsplash was not what they had picked out. They informed the builder of this mistake. The builder told them this was indeed the tile which they had picked and he could not or would not change it now. It was too late. The couple was very unhappy. This ceramic was not even on display in the selection store for them to pick. 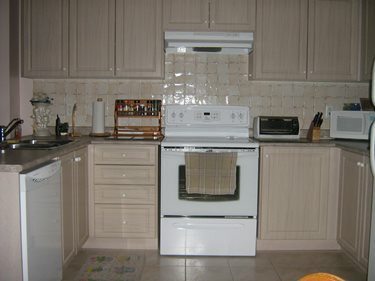 They had to suffer with this backsplash which they simply hated. 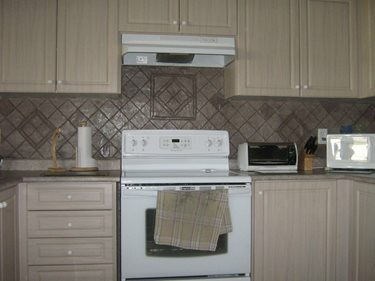 They did not know what to do in order to have a backsplash which they wanted. If they were to remove the tile to replace with new tile, the drywall would likely have to be replaced or repaired as well. If they were to tile over the existing tile, it would be very thick. I met this couple at a mutual friend's dinner party. After hearing their story I suggested overlaying the ceramic using our Flex-C-Ment faux stone product. I told them we could do various colours and patterns as well as textures. They became very interested and once they saw some of our work, they were really excited! We completed the decorative overlay with a stone finish texture and hand carved into a diamond pattern. I hand coloured using a sponge. With the same colour (Mesquite) I shaded different tones throughout the project. The completed project looked amazing and the customers were very pleased. They were so pleased that in fact they insisted on taking us for dinner too!